It's been a while since I broke down a meal for my Cooking on a Budget series. It's not that I haven't been watching my food expenditures. It's more that I've been too lazy to break out the costs. It also occurs to me that I should offer some kind of clarification for how I calculate the costs of my dishes. I don't factor in the energy costs of my cooking - how much electricity I use on any appliances, or how much gas for the stove and oven. In general, I will use the actual cost of my ingredients, so if I find something on sale I will account for that in my calculations. I do not count spices. I do count oil, butter, and other fats. So my calculations are casual at best, but I think they are valid enough to give you a general idea of how much it would cost to prepare any of these meals. 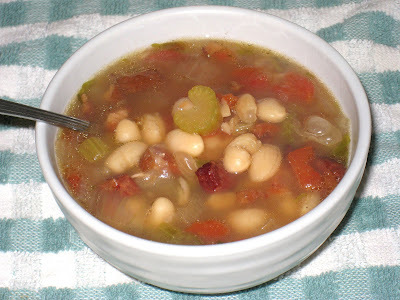 Several years ago I made the Navy Bean and Bacon soup from a recipe in the 1980 edition of The Good Housekeeping Illustrated Cookbook. I have mentioned many times that this is my go-to cookbook, and judging from the reviews there are many people who agree with me. However, if you decide to get yourself a copy make sure it's the 1980 edition. They updated it a few years ago and the newer edition isn't nearly as good as the earlier one. The soup was excellent, and I always meant to make it again but I never got around to it. But after I found those wonderful Dreymiller and Kray bacon ends I remembered how good this was, and couldn't stop thinking about how good it would be with this bacon. So I pulled out the recipe and took a look. You cook the beans in 9 cups of water and add chicken bouillon cubes for flavoring. I no longer use such tings, so I thought using some of my home-made vegetable stock might add to the flavor without adding any of the chemicals. And then, when I was at the grocery store, I got the crazy idea of using some apple juice as well. Actually, it wasn't so crazy. I kept thinking of the applewood smoked bacon and it was just a step away to the apple juice when I was trying to think of ways to add flavor to the soup without using the chicken bouillon. The minute I thought of it, I knew it would be a good idea. So I went down the juice aisle and found a decent-looking bottle for a decent price. And then saw this big old gallon of organic unfiltered apple juice for $4.99 up at the checkout stands. I've never heard of World Pure, and the low price made me a little skeptical, especially since it's certified organic by Oregon Tilth, of whom I had never heard. But the price was right and I figured it wouldn't hurt to take a chance. I turned in my little bottle and grabbed one of the jugs. 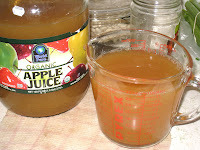 I ended up using a mixture of 3 cups of vegetable broth, 4 cups of water, and 2 cups of apple juice. It was a nice balance, but I forgot that apples are acidic, so the skins on the beans stayed a little tough. Next time, I will cook the beans in the water and vegetable stock and then add the apple juice after the beans have cooked and are already tender. But that is my only complaint. The applewood smoked bacon infused a deep smoky flavor that regular bacon just can't provide. The sweetness of the apple juice enhanced that smokiness, and the vegetable broth tempered the sweetness and kept it from cloying. Except for the slightly tough skins, the beans were tender and hearty. Like most soups, it thickened after the first day, and the flavors intensify the longer it stands. This is an excellent fall dish, and even on the stovetop is not a lot of work. That smoky bacon smell really warms up the house on a chilly day. And this is another one of those soups that freezes well, so you can freeze half right away and have another meal for another day. I now have an abundance of apple juice and am coming up with all kinds of crazy ideas for how to use it. It's sweet, with just a little hint of cidery tartness kicking in at the end. Ideas welcome. The rich, smoky heartiness of this soup makes it feel much more luxurious than it costs to make it. Sort through beans, rinse and cover at least 3 inches over with water. Let soak at least 5 hours, or overnight. Drain the beans and place them in an 8-quart dutch oven or stock pot. Add 4 cups of water and 3 cups of vegetable stock. Cook the bacon in a heavy skillet over medium heat until it is well browned. Remove all but 1/4 cup of the fat. Add onion and celery and cook until they are just translucent, about 10 minutes. Stir the mixture into the pot of beans. Add the bay leaves and ground cloves. Bring to a boil. Cover and reduce heat to a low simmer. Cook for about 1-1/2 hours, until beans are tender. Add 2 cups of apple juice, tomatoes, and salt and pepper to taste. Cover and simmer for another 30 minutes, until the soup has thickened and the flavors have combined. Remove bay leaves and serve. Adapted from The Good Housekeeping Illustrated Cookbook, Edited by Zoe Coulson (Hearst Books, 1980). I add garlic, thyme, and homemade chicken stock, but otherwise, this is a simple and good recipe. Those sound like great additions. I use vegetable stock because that is what I usually have on hand but chicken stock would certainly add some richness. Thanks for commenting!